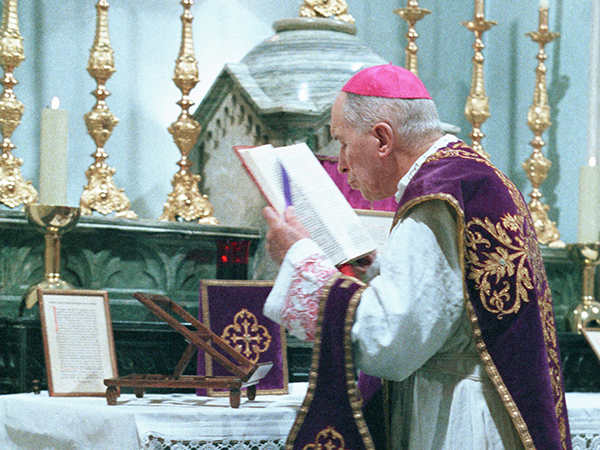 From Libreville to Econe, Archbishop Lefebvre never stopped handing on unchangeably the doctrine about the priesthood that he had received in Rome, in the school of his Spiritan teachers, heirs of the French school of spirituality. Thus he was providentially prepared to confront the serious identity crisis that priests went through in the years after the Council. The chief act of every priest is to offer sacrifice (Heb. 5:1). By a marvelous prerogative, Our Lord Jesus Christ, in voluntarily taking upon Himself on the cross the sufferings and death that His persecutors inflicted on Him, offers to God His Father for all mankind a sacrifice unique in its kind because He is at the same time the priest and the victim, the one who offers and the offering itself. Because of the dignity of the life that He immolates, which is the life of a God-man, because of the comprehensiveness of the sufferings that He assumes, and because of the immense charity with which He offers Himself for the glory of His Father and the salvation of mankind, Jesus offers to His Father superabundant satisfaction for the multitude of sins of all humanity. Consequently the sacrifice of the cross was preeminently propitiatory. During the fifteen years Archbishop Lefebvre was in Dakar the number of priestly ordinations doubles. "The priesthood is the great legacy of Jesus Christ. Our Lord placed His own priesthood in the hands of the Church, that it might continue until the end of time."